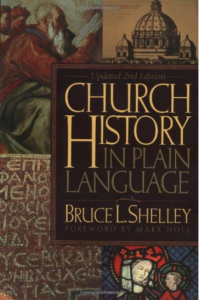 This is a 1995 edition of the 500 page book (Word Pub) by Shelley, professor of church history at Denver Seminary. Once I got over the initial change of reading history written in a more relaxed style, I enjoyed and learned a lot from the book. There were times when I would have wanted the author to show more bias toward Baptists (after all, Shelley calls himself a Baptist with a big “B”) and less toward Catholic history, but that was not his overall purpose. The book is nicely illustrated with time-lines and charts but is not a picture book. It is well indexed for names and movements and has an index of all the Popes from Leo I to the present. Many church history books are cumbersome and wordy and would take too much time for a busy person to read, especially just for interest or pleasure. This book has the advantage of being readable and yet informative. It can give you that broad perspective of seeing and connecting people and events over a two thousand year period. It was worth my time.